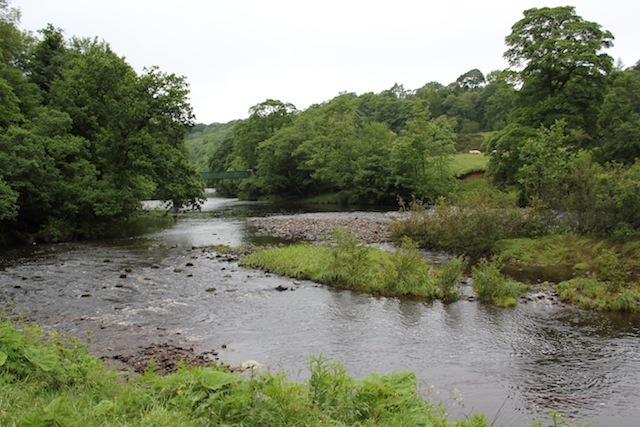 River Tees meets the Balder, Cotherstone, England, June 2012. 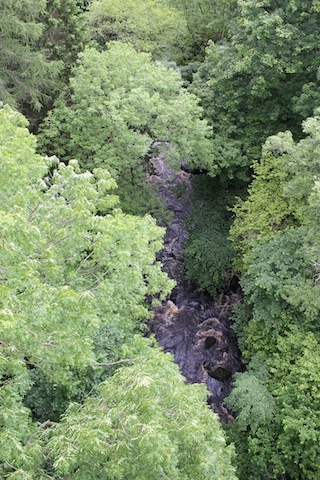 River Balder runs high, June, 2012. 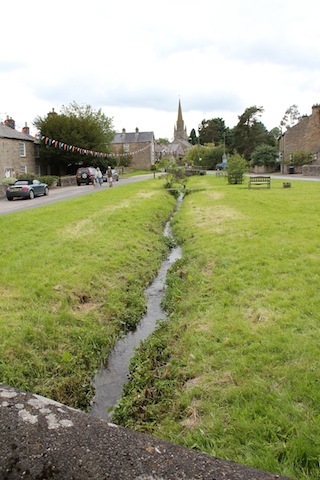 In Cotherstone Village Green, a stream runs down the center. As rain allowed, another cousin and I walked the village. While the walks invariably began in back lanes, no matter what route we took, soon we crossed streams, stream after stream. Somehow we always returned to the intersection of the Balder and Tees (pictured top). I have been to Cotherstone many times over many years, usually at Christmas, but never did it strike me so forcibly that this village evolved in Roman times when there was no choice for these master engineers but to work with nature and that was precisely what made it so lovely. High ground was for buildings, low ground for water. Remarkably, in this wettest interval in what is normally a wet land, gardeners were harvesting water. And there came another reminder: there is proximity to water, and there is catching it to do your bidding. Here follows some photos and random thoughts had while walking in the glorious wet of a place where rivers still run. Coming from a dry city where huge private gardens are fed with imported water, it was striking to see the reverse in northern England. 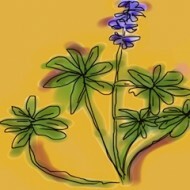 Private gardens are small, with little or no lawn. 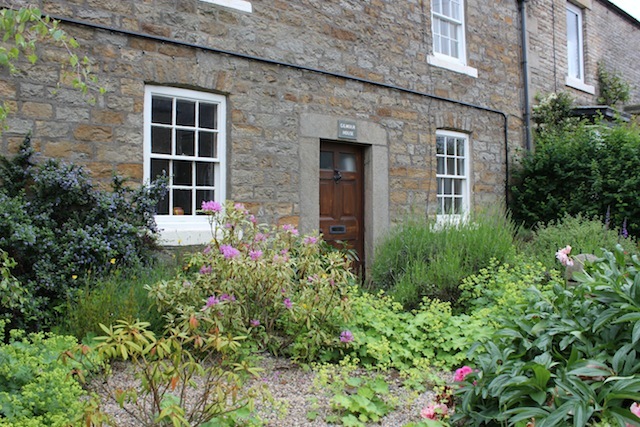 In Cotherstone, most lawn occurs in public spaces where it draws people together. 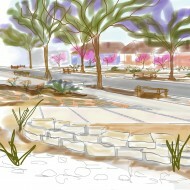 Moreover, a stream flows through the village green. Frustratingly, I saw more California lilac in a short walk in northern England than I do in the same length of stroll here in the plant’s native range. A succession of plastic trash cans rigged with spilling funnels set up along a greenhouse provide enough water to hydrate sheltered seedlings through germination. 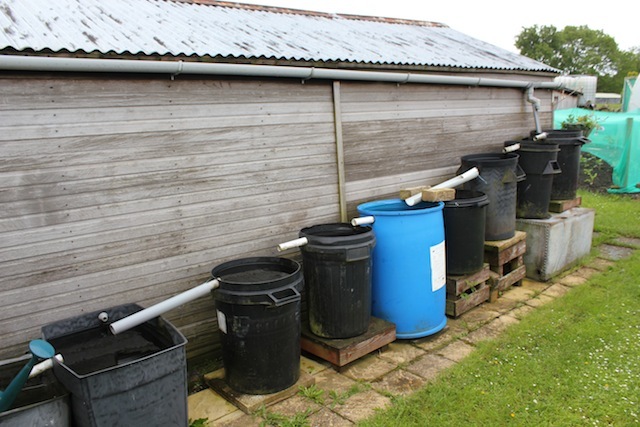 This set-up is a smart, cheap alternative to the expensive 600-gallon rain barrels that can cost as much as $1,000 in Los Angeles. Front gardens are small, dominated by flowers. Note the California lilac to the left. 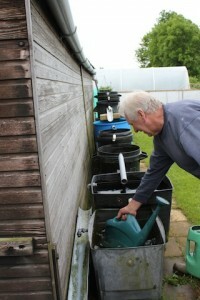 Captured water feeds the seedlings that become the summer veg at Cotherstone’s Fox & Hounds pub. Growing tomatoes and squash here is a feat in a short, cold season, but gardeners do it, relying heavily on greenhouses and poly-tunnels. In a vegetable garden off one of the lanes, I found a skilled gardener named Barry filling his watering can from rain barrels that he set up along a shed. This supplies his seedlings so no energy-intensive pumped water is needed to get plants established in waterproof greenhouses. His garden supplies the local pub, which in London or Los Angeles would be called a “gastro pub” because people go there to eat and not just drink. My mind is tired, addled by emotion, jet-lag and cross-cultural associations. I am farther than I would choose from people and a place that I love. If this sounds like everything there is great and everything here isn’t, please weight it for sentiment. During a walk, one of my cousins and I noticed wilting thistles. The farmers had obviously been spraying fields just as this summer drought-buster of a storm front had moved through. Swept into those roaring waters and foaming eddies of the Tees and Balder was clearly plenty of herbicide. We all have so much to learn. But back here in LA, where our streams have been buried and rivers turned into a fenced, largely inaccessible flood control network, I wonder if we could even begin to make that association? The imperfect, clearly improvable lesson I wish we could take from England is that respect for water begins with proximity to it. Oddly enough, the second day back in Southern California, the Los Angeles Department of Water & Power announced resumption of its cash-for-grass program to help turn us more sustainable, and yes, more English, in our gardening ways. It’s good news, I suppose, but blinking through fatigue, I can’t escape the conviction that we will need more than fitful rebates to become what utility agencies coyly call “water-wise.” We will need to know water to respect it. We need our streams and rivers restored to profoundly appreciate how dependent we are on that miraculous intersection where land meets fresh water. lovely reflection, Emily. And you know I say AMEN to your closing comment!